10 years on and the Online generation continues to support indigenous reconciliation through a new App. A decade after 300,000 people walked across the Sydney Harbour Bridge in support of indigenous reconciliation, a new generation of supporters is preparing to do the same thing but this time they’ll be walking across a virtual bridge via a computer App. 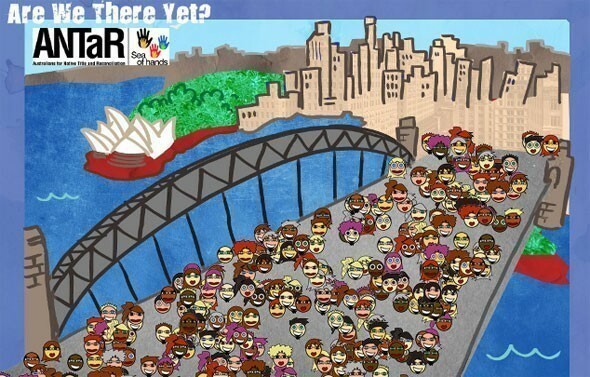 The application allows users to create online “ANTaR avatars” representing themselves and place them onto a recreation of the Sydney Harbour Bridge, indicating their support of indigenous reconciliation. They can then send links to their friends, challenging them to find their ANTaR avatar on the iconic bridge in a “Where’s Wally?” style challenge. Dr Peter Lewis, the president of ANTaR Victoria (Australians for Native Title & Reconciliation) say there are thousands of people around today who would have loved to been part of that historic walk. Dr Lewis says participating in the virtual bridge walk for reconciliation will give some of those people a chance to show their support ten years later, in a fun and innovative way that they can share with their friends. The virtual bridge walk comes as part of ANTaR’s “Are We There Yet?” campaign, which takes a serious look at the issue of reconciliation and asks why there haven’t been more positive outcomes for Indigenous Australians since the bridge walks of 2000. Dr Lewis says ten years on and it feels like they've been walking two steps forward and one step back and if reconciliation itself were a bridge, then Australia has only really crossed it halfway. He says between the Royal Commission into Black Deaths in Custody, the Bringing Them Home Report and the Council for Aboriginal Reconciliation’s Roadmap Towards Reconciliation there have been a total 419 considered recommendations for Indigenous Australians. The virtual bridge walk for reconciliation will be officially launched on Friday May 28 by ANTaR National President Janet Hunt as part of the “Are We There Yet?” Film Festival being staged at 8pm at Melbourne Town Hall. Australians for Native Title & Reconciliation (ANTaR) began in 1997 in response to a swell of public anger towards Federal Government moves to wind back Indigenous native title rights. In Victoria, more than 30000 people became involved, forming groups in most of the 37 Federal electorates in the State. ANTaR is an independent, national network of mainly non-Indigenous organisations and individuals working in support of justice for Aboriginal and Torres Strait Islander peoples in Australia. Much of ANTaR’s work is carried out by peak state and territory ANTaRs and by numerous local groups.